Four blade Bronze - 22: X 23"
Generator is a MASE 4 KW with approximately 900 hours. Inverter is a Heart Freedom 25. Batteries are about two years old. Bayliner uses a hand laid up production system with cored construction. The hull to deck joint is both bonded and mechanically fasted with stainless screws. There are full canvas covers for the windshield and interior curtains. Interior wood work is in excellent condition due to the covers and previous moorage under cover. The interior of the vessel is very spacious. Upon entering from the aft deck you'll find a built-in L-shaped dinette on the starboard side with a TV mounted on the aft wall. Forward of the dinette is the lower helm station with a built in seat. The galley is opposite the helm on the port side and has an under-counter refrigerator/ freezer and a 2 burner countertop propane stove. The microwave is mounted under the counter. Moving aft on the port side the is a custom cabinet with wine rack. The ice maker is mounter in the aft end of the galley. There is also a built in vacuum cleaner. Going forward , the 2nd stateroom is on the starboard side and one of two doors to the head is to port. Moving into the master state room with its own door to the head, the queen sized berth is on center line. There are two hanging lockers and a TV mounted on the aft bulkhead. Back in the aft cockpit you'll find a staircase to the fly bridge, which is easy to move up and down with plenty of grab rails. The fly bridge has the upper helm to starboard with a dinette to port. There is an instrument cover plus bimini with enclosure. The owner has had the boat for about 10 years but never installed the top. The boat is easy to handle from both stations. Cabin heat is provided by electric 110 volt wall heaters. The Bayliner 37 is an earlier model of what led the evolution to the Meridian. One of the things that separates the models is that this model has both an upper and lower station. The boat has had light use and has been in covered moorage for the past 10 years. There are bow and stern thrusters installed and make handling in close quarters easy. The 330 HP Cummins 6BTA 5.9 engines have just over 1000 hours and the Mase 4 KW generator has about the same. There are dual electronics -- at the lower station and the fly bridge. The 10 foot AB RIB Inflatable has a 15 HP Mercury 2-stroke engine and cable driven lift at the transom. Overall, the vessel appears to have been well=kept with regular maintenance. 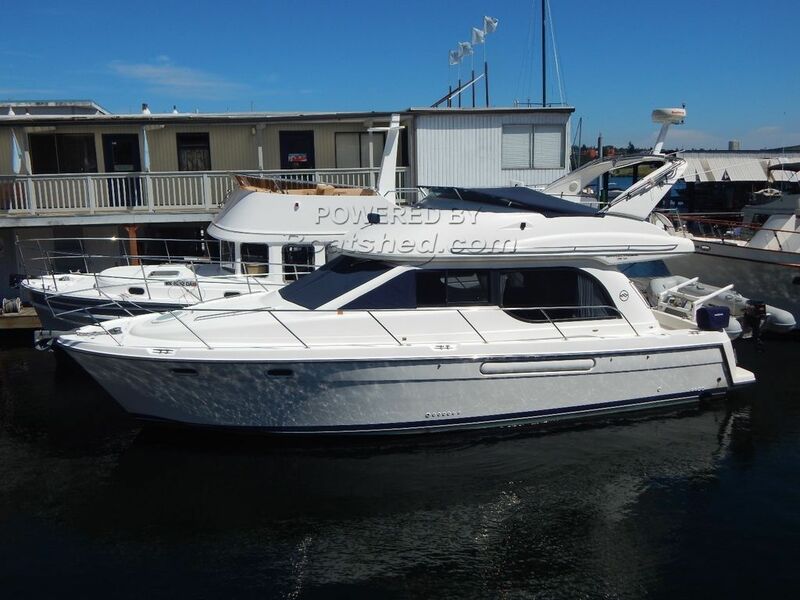 This Bayliner 3788 has been personally photographed and viewed by ROGER DRILL of Boatshed Seattle. Click here for contact details.